This month, after posting Chocolate Rice Krispie Cakes, which were an Easter treat, I have been adding dishes from North Africa and enjoying using the jolly striped Tagine I received for my birthday back in February. Firstly, though, I added my personal spice mixture for Ras el-Hanout plus a simple recipe for preserved or Pickled Lemons (or alternatively lemons and limes). These, along with the spice mixtures of Za’atar and Harissa are some of the distinctive flavours of North African food. I posted several main course dishes: using chicken, lamb and beef. 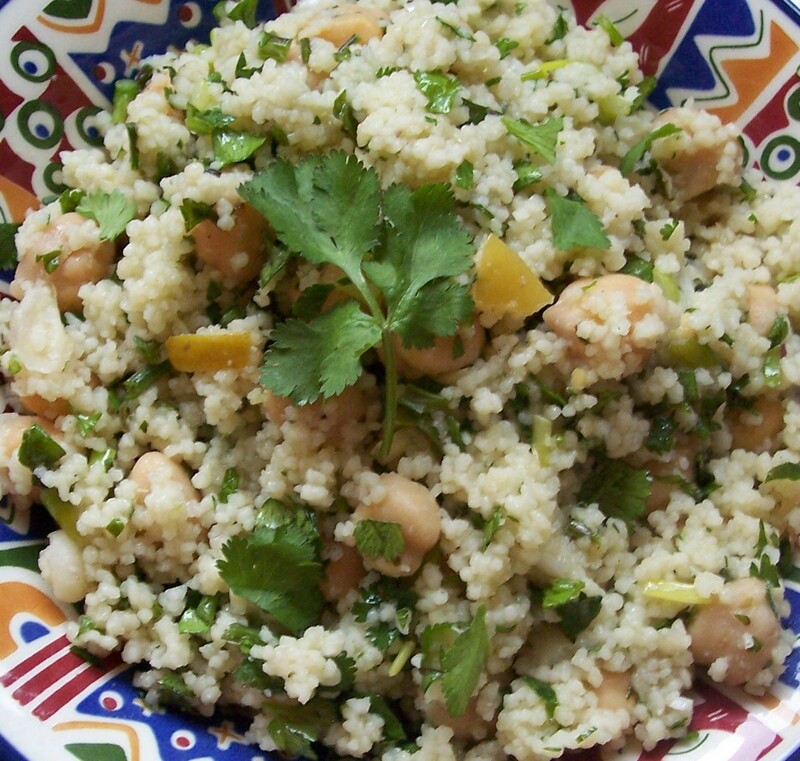 I also included Coriander & Chickpea Couscous Salad our favourite recipe for couscous and finally a delicous dessert that is flavoured with rosewater, a fragrant and often used ingredient in the food of the region, particularly in sweet dishes. Orange flower water is also commonly used in both sweet and savoury foods and was an ingredient in my Beef Stew Tagine (pictured right). (See further down for a full list of dishes posted in April.) There is one more North African dish (North African Style Fish Fillets) which will be posted during May when I will be adding fish recipes. I found a very helpful book in the library, Illustrated Food and Cooking of Africa and the Middle East: A Fascinating Journey Through the Rich and Diverse Cuisines of Morocco, Egypt, Ethiopia, Kenya, Nigeria, Turkey and Lebanon by Josephine Bacon and Jenni Fleetwood. There are so many attractive recipes and I was sure I would be making more. In fact I loved this book so much I ordered my own copy! It is a book I will enjoy leafing through, particularly for the excellent regional ingredient and cooking information at the front. Easter is a busy time in our household, mostly centred around our church and its family as we celebrated Jesus’ death and Resurrection. On Easter Monday it was good to take a break after the busyness of the previous week and to share dinner with our own family. For this meal and I cooked a Roast Beef dinner with all the trimmings (Yorkshire Puddings, Roast Potatoes and vegetables). For dessert I made a recipe which I recently rediscovered when hunting through some recipe books: Delia Smith’s Lemon Surprise Pudding (remembering that this recipe is so delicious it always has to be doubled!) Alongside I served some Sliced Caramel Oranges, which made a really refreshing accompaniment. On television I have just finished watching Sophie Dahl’s new cookery programme, The Delicious Miss Dahl. Sophie Dahl and her recipes were both attractive to watch, but I was not really sure about the format of the programme, which I found rather irritating. I just wanted to see and learn about the food! There were some lovely and not too difficult recipes, though, including: Arnold Bennett omelette, Peanut butter fudge, Rich chocolate pots with brandy-soaked cherries, Rhubarb and rosewater Eton mess (BBC site recipe no longer available), Toffee apple and pear crumble, Cardamom rice pudding with spiced plums, Borscht and Flourless chocolate cake. The one recipe I have tried so far from the series is Lentil shepherd’s pie with champ, which I adapted very slightly and was much enjoyed. I will post my version in due course. Food Focus – Fish & Bananas, though not together in the same recipe! Coming up next month are some delicious and relatively uncomplicated fish recipes alternating with banana recipes. These will be especially useful if you have a bunch on the dish that are a bit past their best and starting to brown. I will also be dipping into some books of recipes from the Far East: Far Eastern Odyssey by Rick Stein and Far Eastern Floyd by Keith Floyd, being just two. Also this month I am off to Paris for a few days. This is not my first visit, so it will be a chance to visit some places not previously explored: we are particularly interested in seeing the Marais area, Pere Lachaise Cemetary (better than it sounds!) and Parc des Buttes Chaumont. Apart from sampling the food I am especially looking forward to a visit to the Musée d’Orsay, the major art gallery housing Impressionist paintings. Wonderful! We always look forward to visits to France, home of wine, cheese, patisserie and lots of other good things beside! The first of March dawned bright and sunny and spring is most definitely in the air with a row of daffodils now making a lovely yellow splash in the garden. The scents of Spring are starting to be on the air. 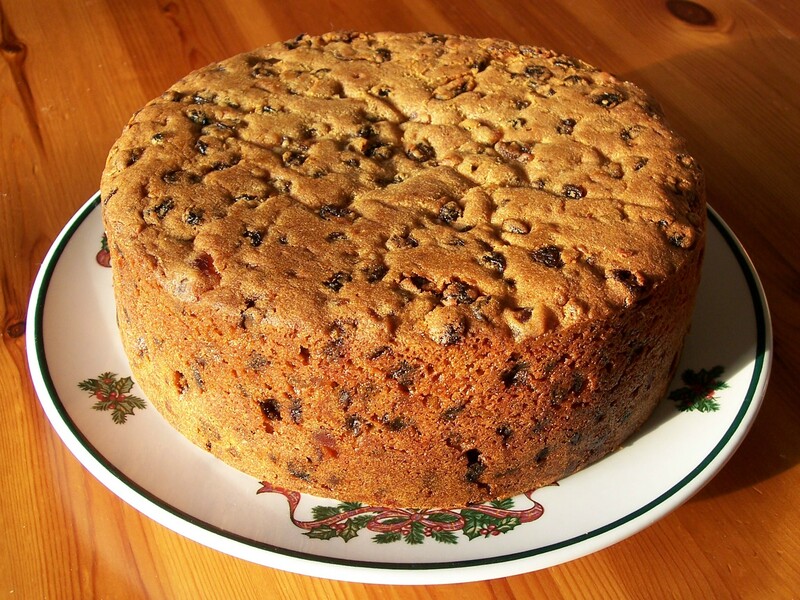 Floral fragranced food has appeared this month, with orange flower water added to both cake mixture and icing and also rosewater infusing desserts. Lavender is also commonly used as a culinary flavouring, with Lavender sugar being easy to make by simply putting a few stems in a jar of sugar and leaving it to absorb the scent. Lavender is also sometimes used in Herbes de Provence, a fragrant herb mixture from the south of France. All of these scents can also be used in ice creams and as the summer goes on I shall be getting out the ice cream maker again in order to try them. I have also been researching another bottled fragrance I have seen in shops: Kewra water (from the Pandanus flower), but have yet to buy a some. I’d like to have a recipe or two to use first: if you have a one to share, please do get in touch via the comments box below. 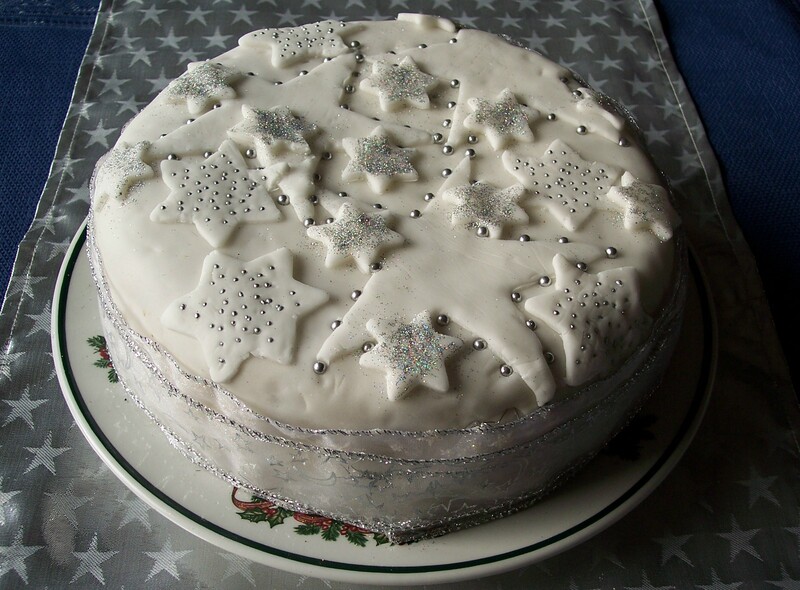 So what have I been up to in the kitchen this month? I started with a marmalade making session, having found some Seville oranges on the market. These have such a short season and can be found for just a few short weeks from late January to late February. I made what I have called ‘Oxford’ (& ‘Cambridge’) Style Seville Marmalades. I had been planning to post some cake recipes, so started with some citrus ones: Fragrant Marmalade Cake and Lemon Drizzle Bread, followed by a Fragrant Chocolate Orange Marble Cake using the versatile basic recipe for The Adaptable Sponge. 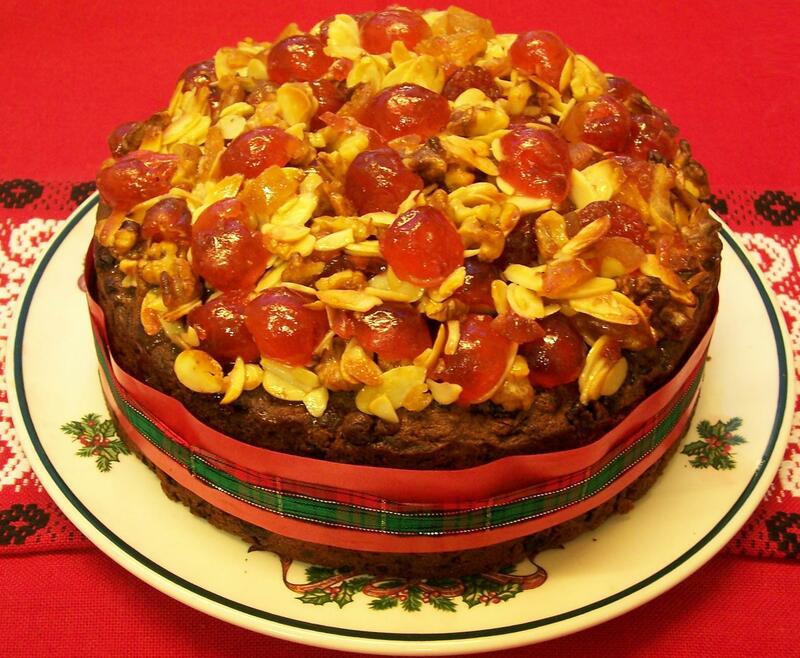 I then moved on to some of our favourite family fruit cakes: Bran Brack – Irish Tea Bread and a much used family recipe called ‘Knock Up’ Fruit Cake, which can be easily adapted with a variety of ingredients: I separately posted a Apricot, Date & Brazil Nut Cake version of this cake where I doubled the quantity to make two cakes, one of which was for Mothering Sunday teatime. Finally there is Gingerbread Cake, which I first learned to make at school but has stood the test of time and Nigel Slater’s unusual but delicious Beetroot Seed Cake. Easter this year falls at the very start of April so at the end of March and in Holy week I shall make my usual pre-Easter food preparations. 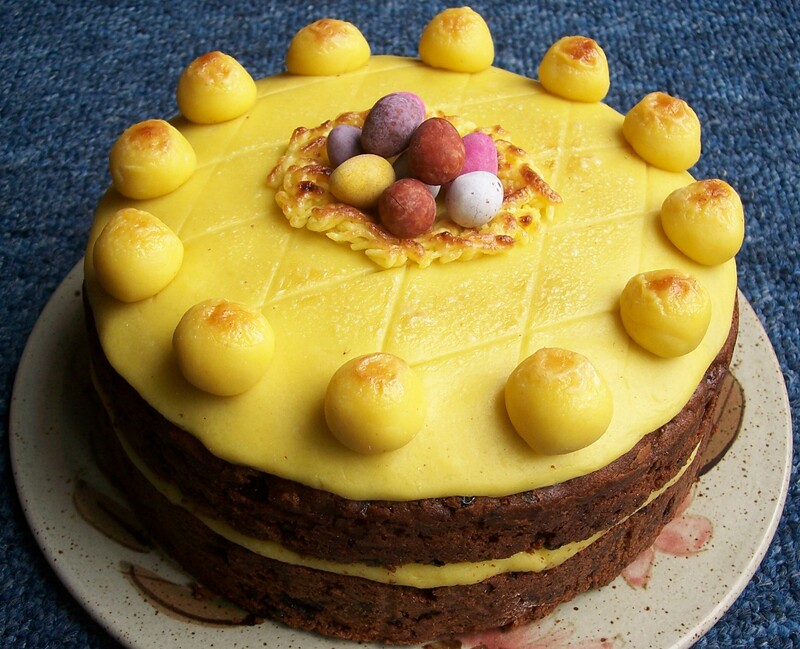 The Simnel Cake is looking lovely – I use the family Special Occasion Cake recipe handed down from my Nanna: my father’s mother. There will be Spicy Hot Cross Buns, of course, using the same Nigella Lawson recipe as last year, with Cardamom giving a lovely fragrance. 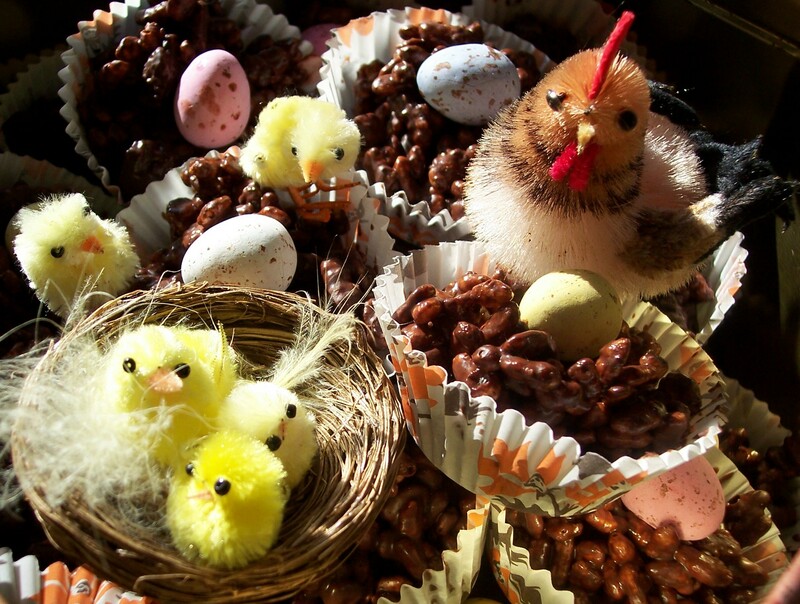 I shall also be making Easter Biscuits and am hoping my daughter will help me make some Chocolate Rice Krispie Nests using the extra sugar coated eggs I have bought. March is a busy month for celebrating. We have birthdays, a wedding anniversary and usually Mothering Sunday as well: all these dates usually falling within a few days of each other. I love feeding friends and family to celebrate special occasions and was delighted to give mum a special birthday meal. We ate Duck Stewed in a Vietnamese Style Spiced Orange Sauce, which was flavoured with Star Anise, a recipe from Rick Stein’s Far Eastern Odyssey that I had seen him make on TV in Saturday Kitchen. I had previously made a chicken version and knew that it was delicious as well as slightly unusual. (Mum likes trying new things.) This was served with some Thai Jasmine Rice and some simply stir fried vegetables. 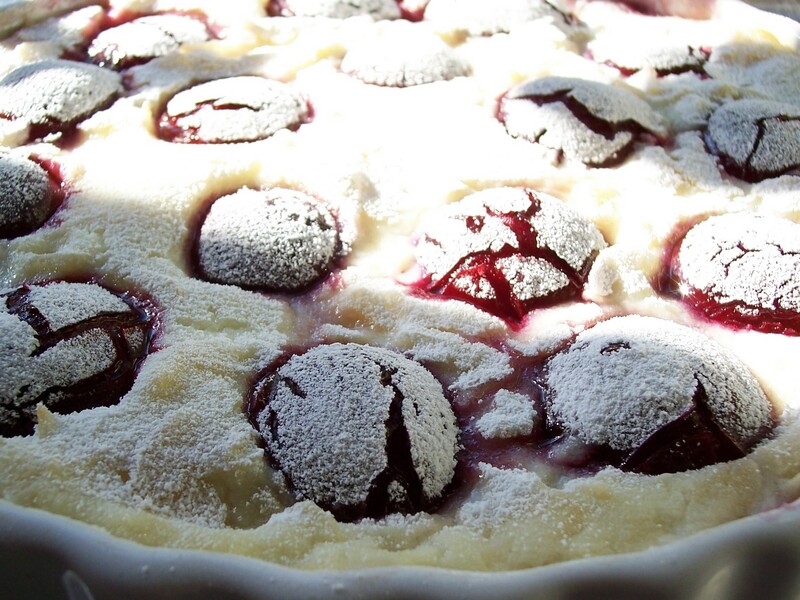 Dessert was Cherry & Rosewater Pavlova Meringue Roulade, from a recipe by Rachel Allen. I will definitely be making these again, I made some simple stir fried veggies, but I need to experiment to find a good Thai vegetable recipe. Recently, I have started to post only two rather than three recipes each week, due to time commitments. 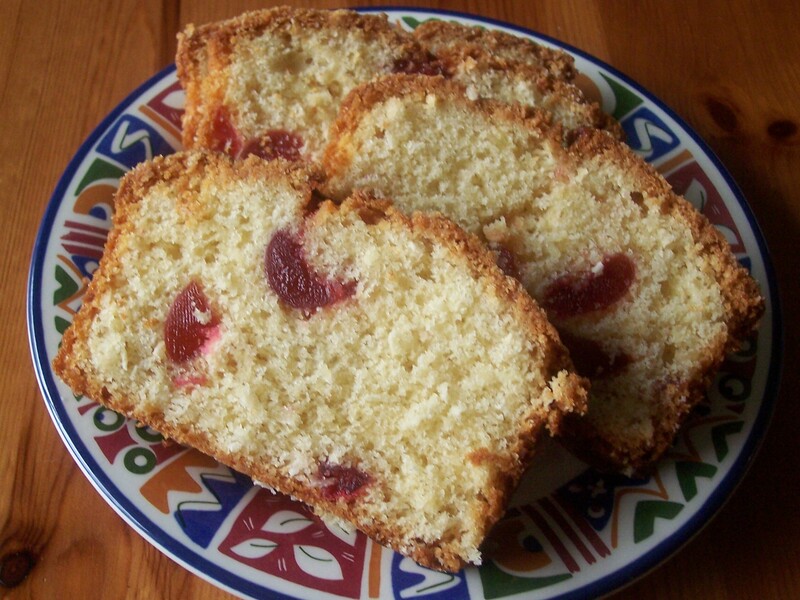 However, to keep to the spirit of three posts a week, I have started adding Meanderings Revisited, a brief midweek post linking to a favourite recipe from my archive. 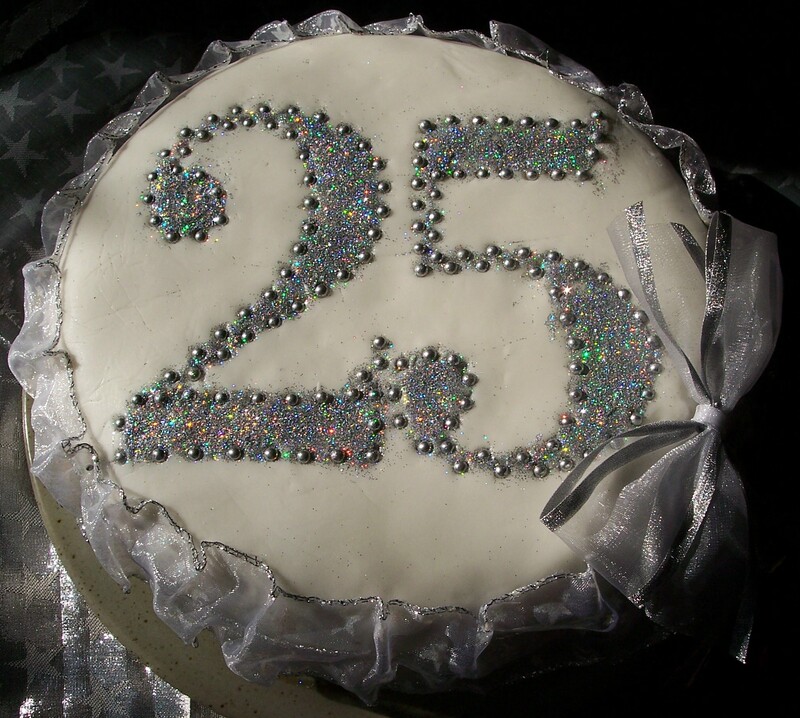 Finally, on 1 April I will have been Meandering through my Cookbook for one year, my 1st cookbook ‘Blogiversary’. I am amazed at how many posts there have been and the variety of material I have covered. Here’s to my second year: I have lots of lovely recipes waiting to be shared, so watch this space! 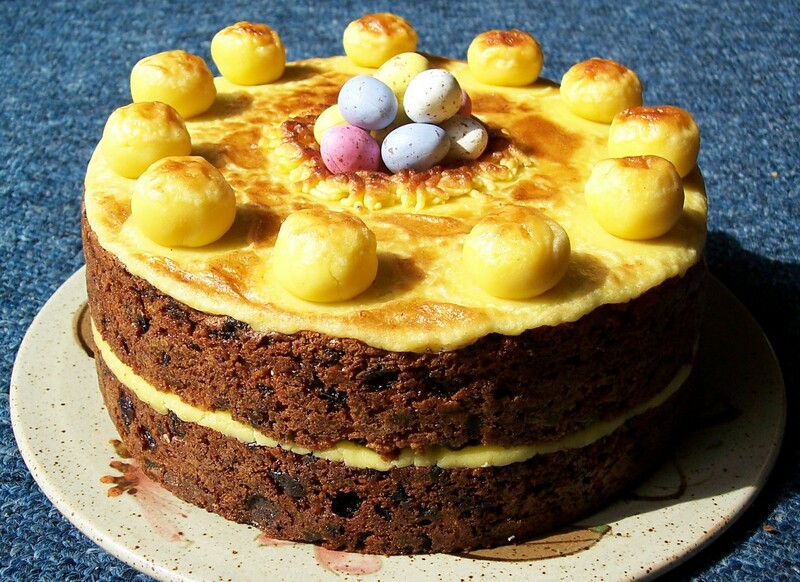 There will continue to be a taste of Easter in the recipes posted at the start of April. Mostly, however during April, I will be posting some of the North African style recipes I have tried in the past few weeks, especially recipes to go with or using the Tagine I received for my birthday in February. I have been learning about the spice mixture Ras el-Hanout, which I have mixed myself and have also used Rosewater as a flavouring in several dishes. The Rosewater proved to be a revelation – fragrant and delicious, I am definitely hooked! Thinking further ahead, as the evenings get lighter I hope that the food will get lighter too (and possibly my waistline too!) A chance, perhaps, to get back to simpler foods with more salads. The word biscuit literally means twice cooked, taken from the Latin bis (twice) and coquere (to cook). It is this slight cooling followed by a second burst of heat that gives crispness to a biscuit, a method used by the recipe I use for Easter Biscuits. Sure enough the resulting biscuits are light and crisp and very ‘moreish’: a crispy sugar topped treat for Easter. 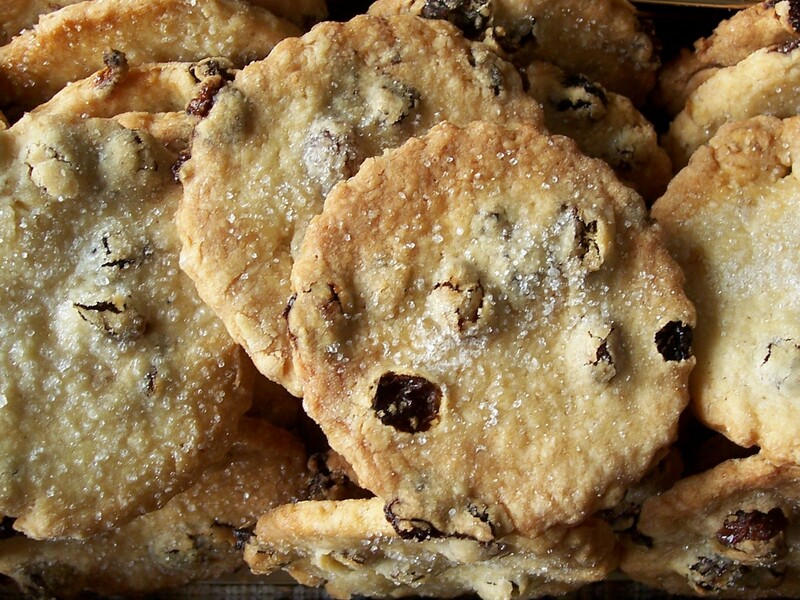 These Easter Biscuits are similar to the round ‘fruit shortcakes’ that can be found in shops, sometimes called ‘squashed fly biscuits’ (although I know that this title can also be given to the long Garibaldi biscuits). I am not sure why they should particularly be associated with Easter. Easter Biscuits are said to have originated in the West Country of Britain where they were given as gifts on Easter Sunday, (though they are also claimed by Shropshire and probably other places as well). They were often larger too, measuring up to 4 inches (10cm) across. An article in the Times, which includes an alternative recipe (untried by me) suggests that the ‘tradition’ be moved to Easter Monday. 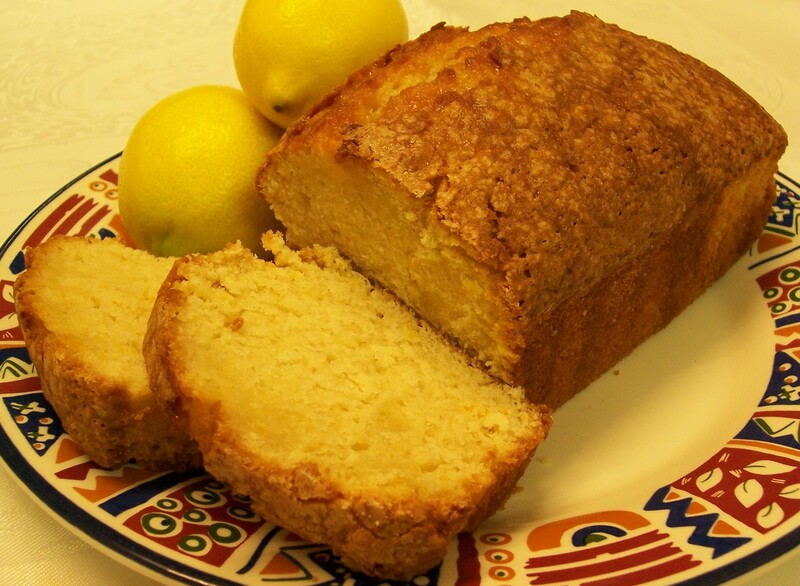 Not all recipes include the mixed spice with some Easter Biscuits including lemon zest, such as this Netmums recipe (also untried by me). I will definitely add zest next time, even though there is already mixed peel in the recipe. The recipe used below comes from The Women’s Institute Book of Biscuits which was published jointly with Mornflake Oats. For these small biscuits I used a 2 inch (5cm) cutter: a metal one is good as it cuts through the pieces of fruit. However, I like the idea of bigger biscuits and I will definitely be making them larger next time. 1. Preheat the oven to 170oC Fan oven/180oC/350oF/Gas 4. Grease 2 or 3 baking sheets. 2. Cream the butter and the sugar together and beat until it is soft and fluffy. 3. Add the egg yolk, spice, fruit and flour and mix together. 4. Add just enough milk to make a stiff dough. If the dough becomes sticky then add a little more flour but too much flour will make the biscuits a little hard and less rich. 5. 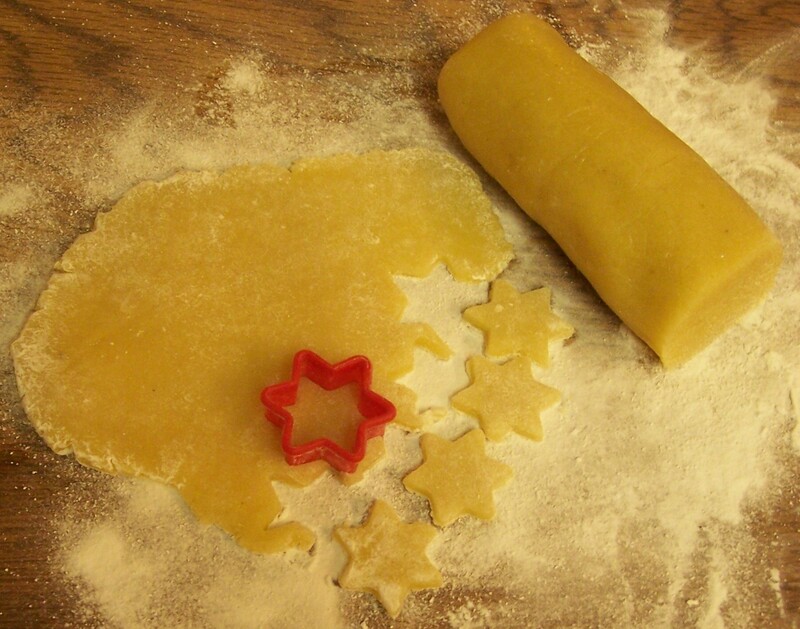 Roll the dough out thinly on a floured surface. Cut rounds and place them fairly closely on the greased baking sheet: they do not need too much room for expansion. 6. Bake for 15-20 minutes. After 10 minutes remove the trays from the oven, brush the biscuits with egg white or a little milk and sprinkle with a little caster sugar. Return them to the oven for the remaining time – remove when just starting to become golden. 7. Remove from the trays and cool on a wire rack. Store in an airtight box or tin. Ham is a traditional meat for the Christmas table, alongside the usual turkey. 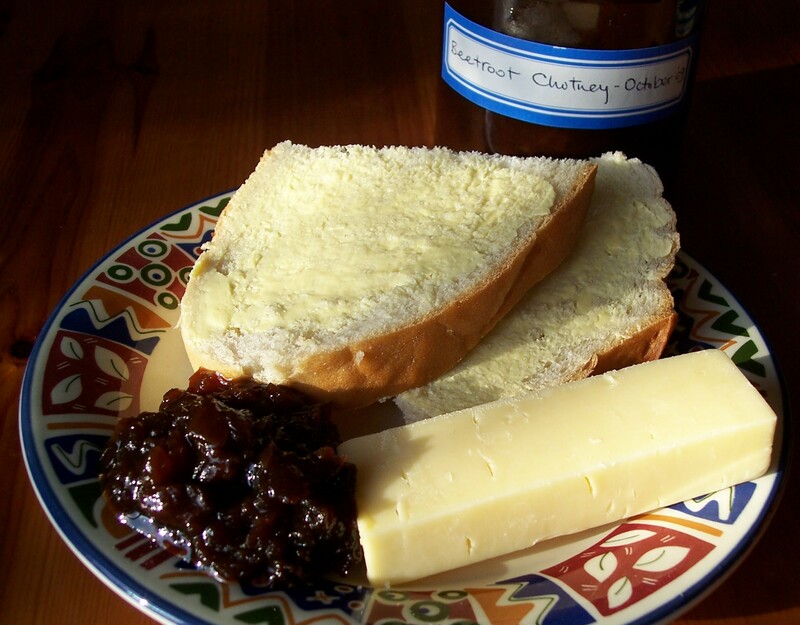 We particularly enjoy them together at tea time as cold cuts with salad, pickles and chutneys. Cooking the ham completely or partially in ginger ale, rather than conventionally in water, gives a lovely sweet flavour which penetrates the whole joint of meat. Adding a glaze followed by a quick second cooking adds a further gingery spicy/sweet outer crust. I have served gammon in this way at a special Sunday lunch for family, accompanied by vegetables or ratatouille. It is very easy to make as the joint can be cooked the night before for a Sunday lunch and covered in the marinade for an hour or so before the short final cooking. I substituted canned ginger beer for the ginger ale of the original recipe (I used Old Jamaica brand, but any can be substituted.) The original recipe was for a large (12lb) joint of meat which was cooked in 7 litres (12 pints) of ginger ale, which at 1 pint per lb seemed rather a lot. For a very small ham joint of about 2lbs I used just one can, which still gave a good flavour but probably two, or at most three, cans would be ample for a larger joint. I am sure it does not matter if the ham is cooked in a mixture of ginger ale and a little water. It is important that the joint is pre-soaked to remove some of the salt used in the curing process. The original recipe uses Ginger Marmalade: the combination of Orange Marmalade and ground ginger that I use was suggested as an alternative. 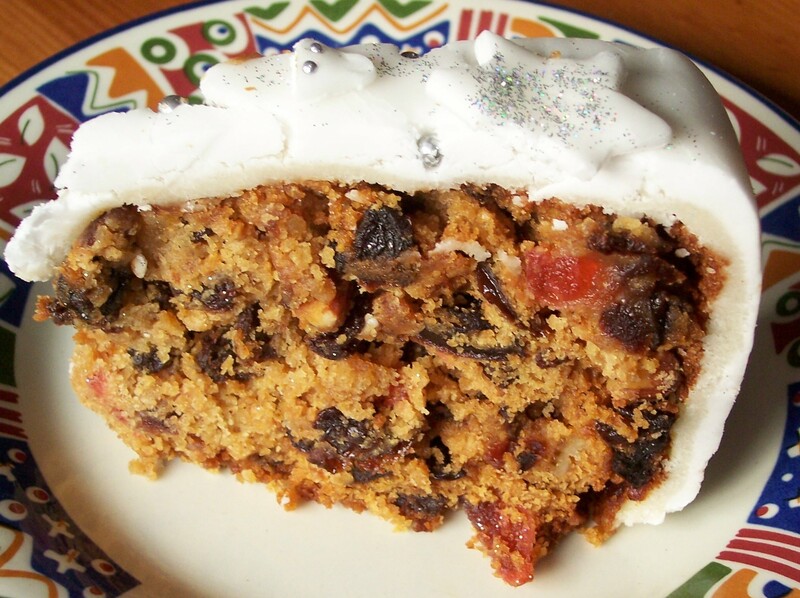 This recipe originally came from Nigella Lawson’s Christmas 2008 television programme, from her book Nigella Express. I scribbled the details, which were simple, on some scrap paper but was glad to find Nigella’s recipe for Ginger Glazed Ham online as well. The quantities given below are my adaptations of the original which have worked well for me. For a plain boiled ham, without using ginger beer, use all water plus 6-8 black peppercorns and a small bay leaf. 1. Place unwrapped gammon piece in a heatproof blow and pour over boiling water. Pre-heat the slow cooker on high for 30minutes. 2. Remove gammon from bowl and throw away water. Place gammon in slow cooker, cover with ginger beer (one can may be enough) and top up with boiling water. Turn cooker to low and leave to cook: up to 2lb (up to 1kg) ham for 4-hrs, 3-4lb (1.5-2kg) for 5-6hrs. 1. Place the joint a good sized pan and cover with boiling water. Depending on size, leave it to soak for at least 20 minutes but longer if you wish a to remove more salt. If you are short of time, make sure you remove the most salty juices by pouring over the boiling water and leave for at least five minutes. Strain away the salty water. 2. Return the joint to the pan and pour over the ginger beer, topping it up with water so the liquid comes about half way up the pan and a good portion of the ham is covered. Bring the pan to the boil and then lower the heat slightly simmer for 1½hours. 3. Mix together the glaze ingredients a bowl. 4. Towards the end of the cooking time pre-heat the oven to 220oC/425o, unless you are going to finish the joint from cold (see 6 below). 5. Gently lift the ham out of the pan and place on a foil-lined baking tray. Carefully remove any skin, leaving a thin layer of fat. There is no need to score the surface, just cover liberally with the glaze and place the tray with the ham into the hot oven for 20 minutes. 6. Leave the joint to cool and finish the procedure the next day. Cover with the glaze at least 1hour before cooking as the flavours will take longer to penetrate the cold meat. Pre-heat the oven to 220oC/425oF and place the tray with the ham into the hot oven for 20 minutes. 7. The sugars in the glaze will blacken a little while cooking but be careful not to overcook the joint at this stage. 8. Serve hot or cold. Any meat juices from the oven cooking plus a little of the liquid from the stovetop cooking can be thickened with a little cornflour to make a gingery sauce, although taste it well as adding too much cooking liquid could make it salty. I have long felt it is sad that we can buy Hot Cross Buns, with their crosses on, throughout the year. I’d be happy just to have ‘Not Cross’ Buns for most of the year, just putting the crosses on from Good Friday until the end of the Easter season at Pentecost (fifty-two days later) to mark their special seasonal significance. (This year the Dean of St Albans has been saying much the same with an article about reclaiming the Hot Cross Bun in the press.) Hot Cross Buns are especially good when eaten still warm for breakfast or tea on Good Friday, with or without butter. 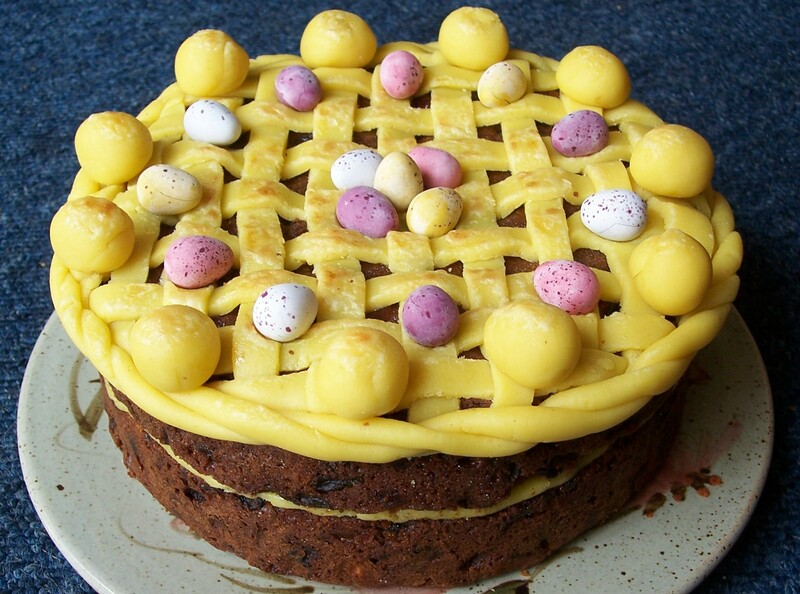 However, made without the crosses, why restrict them to the Easter season as they can be enjoyed at breakfast or tea at any time of the year! I love home made Hot Cross Buns and try to make some every year. 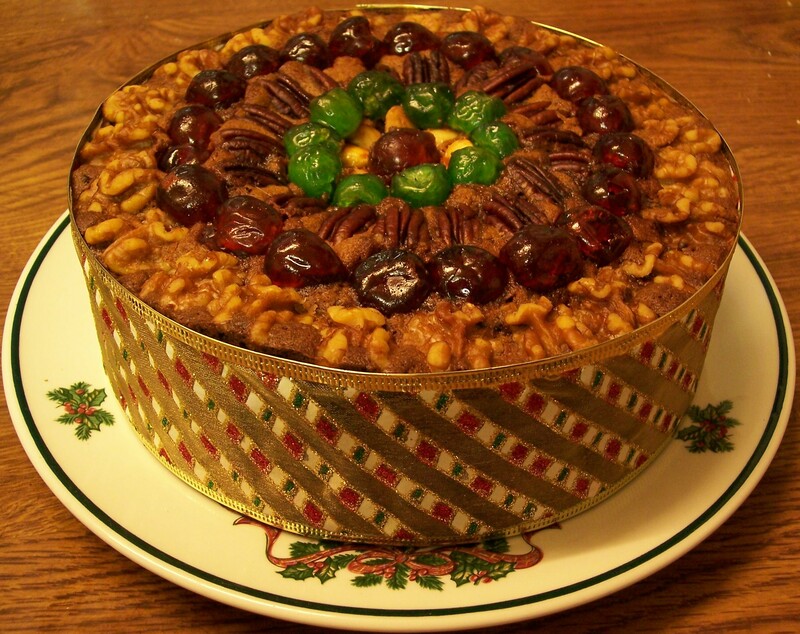 I have tried different recipes but have never felt I have found that ‘extra special’ one – until, that is, this year. Radio Times this week has a recipe feature including Nigella Lawson’s Spicy Hot Cross Buns from her book Feast: Food that Celebrates Life. Finally a recipe to remember – I will most definitely be making these in future years. Interestingly, Nigella uses Cardamom seeds, one of the ingredients used in the buns mentioned in the St Alban’s article where they are given their ancient name ‘grains of paradise’ – appropriately, in my opinion, as I love them! 1. Heat milk, butter, zest, clove and lightly crushed cardomom pods in a saucepan until the butter melts and leave to infuse. 2. Measure the flour, sugar, yeast and dried fruit into a bowl and add the spices. 3. When the infused milk reaches blood temperature, take out the clove and cardamom pods and beat in the egg. 4. Pour the liquid into the bowl of dry ingredients and mix together. 6. Heat oven to 220oC/Fan Oven 200oF/Gas 7. 8. Brush the risen buns with egg wash and then carefully spoon/drip flour mix into the scored cross marks. Bake at the top/middle of the oven for 14-16minutes. 9. When the hot buns come out of the oven, brush immediately with the sugar/water glaze to make them sweet, sticky and shiny. Cool on a wire tray.